It will come as no surprise to you dear readers that I never get tired of singing the praises of vintage shopping and scoring fabulous vintage clothing, accessories, and jewelry! It's hard to beat vintage shopping if you're at all concerned with sustainability issues and if you like pieces that really tell a story. Our favorite resource, the Manhattan Vintage Show for Fall 2018 happened a couple of weeks ago and like always it was a vintage hunter's paradise! It brought together 87 vintage dealers from all over the United States and Canada for 2 days of vintage shopping heaven. This season I really concentrated on checking out all the amazing jewelry at the show and I certainly wasn't disappointed. There were pieces from every decade including some from the Victorian Era. 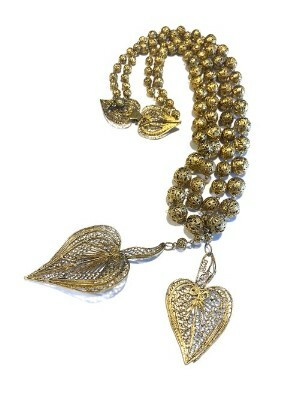 My favorites, however, would have to be all the wonderful bold gold pieces from the 80s and 90s. If you're familiar with the vintage section on our website you know that special pieces from this period are one of our strengths. And I've just added some pieces that are really worth seeing! 1. Vintage is the perfect way to get a major dose of individuality into your wardrobe. Most vintage finds are, by the time we're discovering them, one of kind. 2. For the sheer joy of the hunt, scoring a special vintage piece in an amazing print, shape or color is a major coup. 3. Vintage shopping can be economical, often costing much less than what's currently in store. With vintage, you get a lot of bang for your buck! 1. Always mix vintage with newer pieces and never wear it head to toe or you could end up looking like you're heading to a costume party (unless you are!). Make sure and pair your vintage pieces with new on-trend items to give yourself that interesting and modern mix. 2. Don't be intimidated by vintage or afraid that you won't look like yourself. Look for pieces that reflect your style be it classic, boho, edgy, or something else entirely. You can always find your style represented in vintage wear. 3. Try and find earlier versions of whatever the current runway trends are. This season we're seeing lots of wonderful 70s inspired pieces, especially the early 70s when fringe, paisley, corduroy, velvet, and midi lengths ruled. And of course, 80s and 90s fashion is so totally au courant. 4. Consider tailoring your vintage finds if they don't fit perfectly. Getting your clothes tailored to fit properly is our number 1 tip for looking good, whether you're wearing new or vintage clothing! You'd be amazed at what a difference it makes when your clothes fit your body perfectly. If you want some help with vintage shopping, let me know. CLOSET HORROR SHOW! 5 Tricks That Aren't Too Scary.